AnyMP4 Blu-ray Toolkit 6.1.26 Free Download - Convert video, play Blu-ray, create DVD/BD and transfer files. 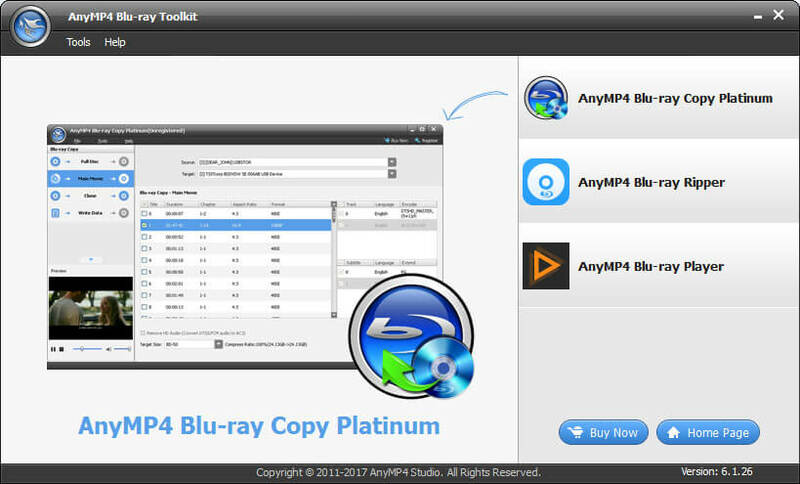 AnyMP4 Blu-ray Toolkit includes Blu-ray Player, FoneTrans, DVD Creator, Blu-ray Creator and 3D Converter, so users can convert video files to 3D and general video/audio formats, burn videos to DVD/BD disc, transfer files between iPhone and computer, convert between 3D and 2D video, and convert between different 3D video. Plus, it supports iPhone XS/XS Max/XR/X/8/8 Plus/7/7 Plus/6s/6s Plus/6, iPad Pro and iPad Air 2, Samsung Galaxy Note 3 and iTunes12.8, iOS12. Users could freely convert any 2D/3D video to 3D mode. The supported 3D mode includes Anaglyph 3D, Side by Side (Half-Width) 3D, Side by Side (Full) 3D, Top and Bottom (Half-Height) 3D and Top and Bottom (Full) 3D. With the built-in 3D Converter, users can easily convert most 3D videos to other 3D modes and standard 2D files. After recording happy time with camcorder, you can burn the recorded videos to DVD disc. The part of Blu-ray Creator program is able to burn any video to BD disc, BD folder or BD iso files. The FoneTrans part allows users totransfer all iPhone files such as TV shows, music, movie, pictures eBooks, Camera Roll, ringtone, SMS (MMS), Contacts and so on to computer. And it also can help you import music, video, ePub, PDF, image files/folders to iPhone/iPad/iPod. The included Blu-ray Player can help users play Blu-ray disc, Blu-ray folder, ISO files, popular videos, including MPG, MPEG, MPEG2, HD video, etc with the perfect video quality. Statement: First, please download the orginal installation package by clicking the download link. Of course you may also download it from the publisher's website. Using AnyMP4 Blu-ray Toolkit crack, key, patch, serial number, registration code, keygen is illegal. The download file hosted at publisher website. We do not provide any download link points to Rapidshare, Hotfile, Depositfiles, Mediafire, Filefactory, etc. or obtained from file sharing programs such as Limewire, Kazaa, Imesh, Ares, BearShare, BitTorrent, WinMX etc. Software piracy is theft. If you like AnyMP4 Blu-ray Toolkit please buy it.